Clea Simon is the author of the Pru Marlowe, Dulcie Schwartz and Theda Krakow mystery series, as well as three nonfiction books. 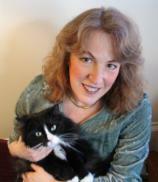 A former journalist, she lives in Somerville, Massachusetts, with her husband Jon and their cat Musetta. Becca, newly single and newly unemployed, wants to believe she has psychic powers. With nothing but time, and a desire for empowerment, she’s studying to become a witch. What she doesn’t know is that her three cats --- Harriet, Laurel and Clara --- are the ones with the real power. And when Harriet --- “a cream-colored longhair with more fur than commonsense” --- conjures a pillow for her own comfort, Becca believes her spells are finally working. Could that be why Trent, the coven’s devilishly handsome leader, has been showing her special attention? Or why Suzanne, a longtime coven member, draws her aside to share a secret --- a confidence that may lead to murder? When Pru Marlowe is called to a forest clearing to help with an illegally trapped bear, she finds a colleague passed out drunk, his pet ferret locked in his truck. When one of her old running buddies turns up dead and then the town's pampered pets begin to disappear, Pru can't tell if her colleague is involved. The offer of a job --- and maybe something more --- from a hunky warden only complicates Pru's life as she goes on her rounds between her small Berkshires hometown and the woods that lie beyond. And although her crotchety tabby, Wallis, would have her make some changes in what has become a familiar routine, Pru knows her special skills set her apart as the only one who can shed light on these crimes --- and save the animals at risk.